Viola, somewhat of a polymath, was born in London in 1884. She was eldest daughter of Maude and Sir Herbert Beerbohm Tree. She got her start early by performing at her father’s company at Her Majesty’s Theatre, and in 1904, she debuted, successfully, as Viola in Twelfth Night. Over the next several years, she appeared in Much Ado About Nothing as Hero, The Tempest as Ariel, Richard II as the Queen, The Merry Wives of Windsor as Anne Page, Ophelia in Hamlet, and Perdita in The Winter’s Tale. 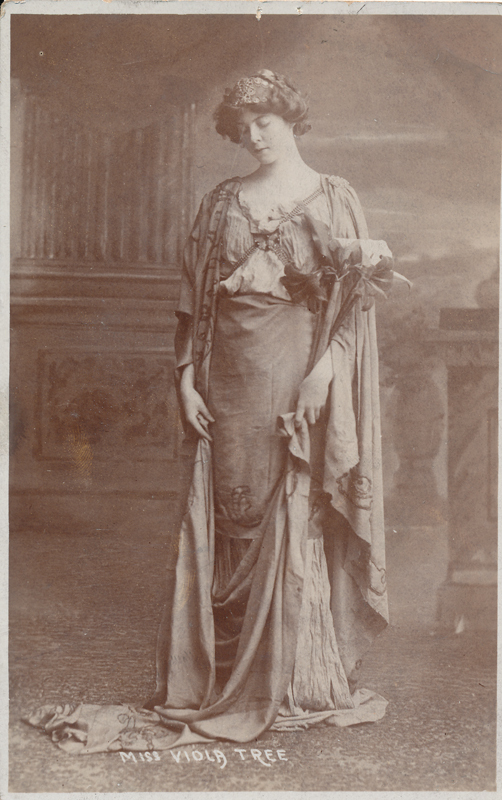 In the latter, Dame Ellen Terry played Hermione. She went on to Italy to pursue her ambitions in opera for some years after that. In 1919, Tree began management of the Aldwych Theatre (later home of the Royal Shakespeare Company, 1960-1982) in London and in 1923, she played her last Shakespeare role—Helena in A Midsummer Night’s Dream. She did, however, continue her stage career and traveled around the world performing. She appeared, also, in several films. One of these, Pygmalion (1938), marked the third time a member of the Tree family had played in a premiere of this Bernard Shaw work. Tree was also a playwright, co-writing The Dancers with Gerald du Maurier in 1923 and The Swallow in 1925. She was also a prolific writer, having published many books in her lifetime: her memoirs, Castles in the Air (1926); a book on etiquette, Can I Help You? (1937); a novel; a biography of her husband; and an anthology, Alan Parsons’ Book (1937).